Welcome to Britain's finest working windmill! The Windmill and Shop will close on Satuday 22nd December 2018 and reopen on Saturday 5th January 2019. Entry to the shop is free. Groups of 10 or more please enquire. All children must be accompanied and supervised by an adult/senior citizen while in the windmill. Regrettably children under 5 years old are only allowed to visit the ground floor of the windmill. Climb all 7 floors and see flour being made in the traditional way by wind-power in the finest and one of the tallest windmills in the British Isles. Selling organic flour, porridge oats, local history books and a variety of good quality souvenirs. 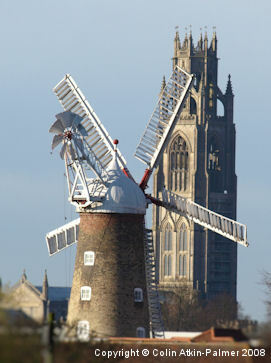 The Windmill and Shop are open 10am to 5pm Wednesday and Saturday.